The U.S. Supreme Court will hear a case Wednesday challenging a landmark civil rights law designed to make sure minorities can get to the polls.Shelby County, Ala. is asking the Supreme Court to get rid of Section 5 of the Voting Rights Act of 1965. That law forces 16 states with a history of discrimination against minority voters to get permission from the U.S. government before changing their election laws. Opponents of Section 5 say it’s too burdensome and unnecessary in the post-Jim Crow era. 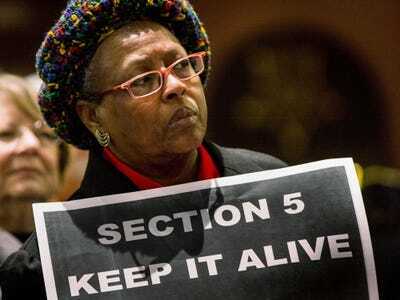 People who are in favour of the law say we need Section 5 to stop states from passing election laws that effectively keep poor and minority voters out of election booths. Section 5 has stopped states from passing voter ID laws, getting rid of early voting, and gerrymandering districts so they’re majority white. Young people – Heather Smith, president of Rock the Vote, has argued that voter ID laws disproportionately impact young people. These laws typically require voters to show non-expired government IDs in order to vote. A voter ID law in Texas let voters use concealed-gun licenses at the polls but not student IDs, Smith pointed out in The New York Times. That law was struck down under Section 5. Poor people – Long election-day lines can discourage poor people from voting. If time is money, then these lines can be kind of a “poll tax,” The New York Times has pointed out. (Poll taxes were common before the Voting Rights Act was passed as a not-so-subtle way of discouraging Southern blacks from voting.) Long lines also have a disproportionate impact on African-Americans and Hispanics, who still have higher average rates of poverty than whites. Early voting solved many of these issues, and the VRA allows the federal government to step in if states with histories of voter discrimination try to cut back on early voting. Old people – The elderly might also have trouble getting the ID necessary to comply with laws that would be allowed if Section 5 dies. NPR reported on a 77-year-old woman who faced a number of obstacles trying to get a proper ID because she was born at home and never had a birth certificate. While it’s clear some voters will suffer if the Supreme Court strikes down Section 5, election law experts have predicted the court’s conservative justices will likely ditch the law. If that law dies, the Democratic party will suffer. Minorities gave President Obama a big boost in 2012, and have historically come out to vote for Democratic candidates. Any laws that potentially stop minorities from voting could hurt Democratic candidates across the United States.